There’s no “perfect” way to engage tech professionals, and it can be difficult to know where to start. Our trick for higher response rates? A 1:1, personalized approach. 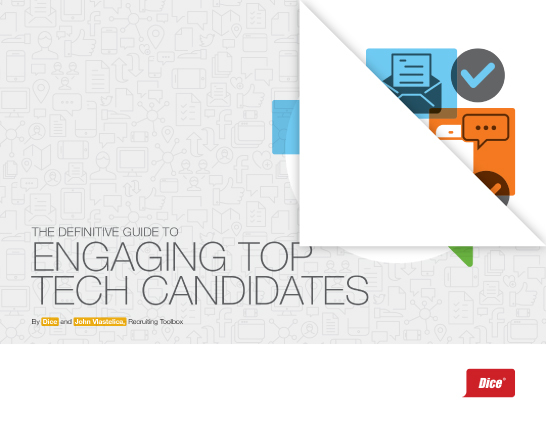 Dice partnered with John Vlastelica of Recruiting Toolbox to provide you this definitive guide for messaging top tech candidates via email, phone and social. Find out how to engage more active and passive candidates using these three key steps: preparation, personalization and persistence. Plus, use John's checklists to know where to begin your research, how to prepare your own social profiles and more. Fill out the form to get the guide, and start shaping your fool-proof engagement strategy today.